Thai Red Duck Curry is one of the most popular types of curries in Thai restaurants in and outside of Thailand. See the Homemade Red Duck Curry Paste recipe below or for convenience, buy a ready made paste. Pour the coconut cream into a wok or sauce pan and simmer for 2 minutes, stirring constantly, until the coconut oil begins to separate out. Add the curry paste, fish sauce, palm sugar and torn kaffir lime leaves. Simmer for 2 more minutes. Add the duck and eggplant. Bring to a boil. Then add the coconut milk and simmer for 5 minutes. Add the pineapple and cherry tomatoes and simmer for 2 minutes. Then add the grapes (if using) and sweet basil leaves. Turn off the heat and serve garnished with the remaining kaffir lime leaves, sweet basil and a few spoonfuls of thick coconut milk. Put the coriander seeds, cardamon pods and black peppercorns in a granite mortar and grind into a powder with a pestle. Add the rest of the ingredients and pound using a pestle for about 10 minutes until the paste is smooth. 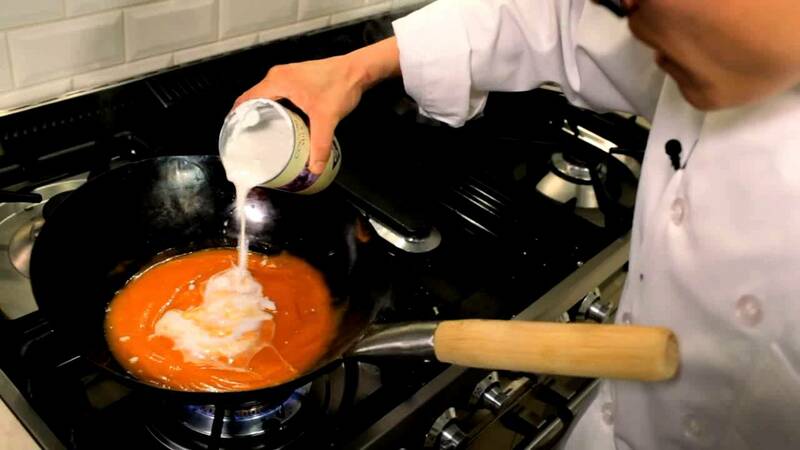 All the ingredients for the paste can also be put into a blender and liquidized. If the paste is too dry, you may need to add a bit of water.